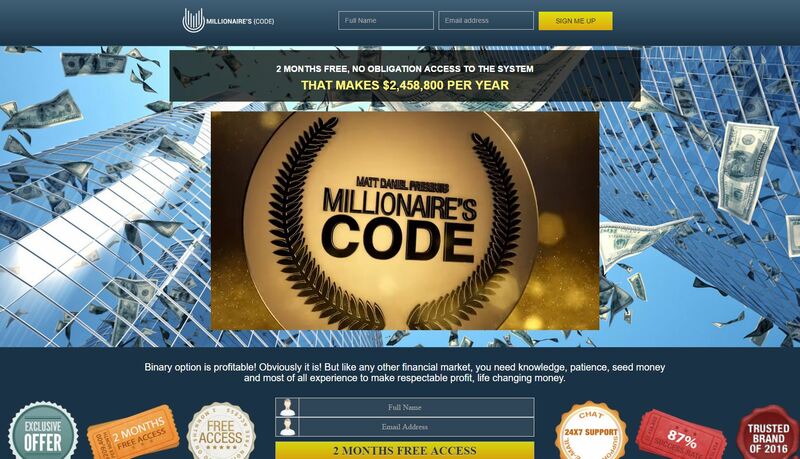 In this review we expose a new binary options scam called “Millionaire’s Code”. It is presented by Matt Daniel. Daniel claims that he was so tired of binary options scams that he paid a team of experts to create a real profitable piece of software, he called it the Millionaire’s Code. This app allegedly has a 87% win rate and can make you more than $200,000 per month. Daniel offers a free trial period of two months, only then you have to pay $200 per month for using the Millionaire’s Code. So here we have Matt Daniel offering us another software that will make us millionaires. But wait a minute, is this the first time we see this guy? No! We saw him already in the Magnetic Profit scam under the name of David Silversmith. It was back in February and already then he was promising us millions. So yeah, it is in fact a well-known scammer. And what about all those people that are making so much money with the Millionaire’s Code? You can see them in the video. Well, these testimonials are of course not real, they were made with paid actors. Take a look at the picture to see where you can hire this woman to tell any lie you want. And what about this unique and miraculous software that is supposed to make you hundreds of thousands of dollars per month? Well, it is not so unique, it is a software used by binary options scammers only. Lately you could see it in the Perpetual Formula scam for example. This app is known for losing money to its users. Because you won’t be allowed to use it until you deposit at least $250 with a selected broker, it is not really free. The Millionaire’s Code is a typical scam. They force you to deposit with a selected broker and then you have to let them lose your deposit with their crappy software. So stay away. If you are interested in trying binary options risk free, you can do that on a demo account. There you will learn what it takes to become profitable and really make money in binary options trading. Nobody will do that for you for free.